Adriaan van de Velde (1635-1672) was born in Amsterdam. He was equally proficient in painting landscapes, coastal views, domestic animals, and human figures. Aelbert Cuyp (1620-1691) excelled in landscape paintings. The calm, and brightly lighted countryside and atmospheric effects of hazy mornings. Allert van Everdingen (1621-1675) studied in Haarlem and painted landscapes, he painted also sea scenes and storms, picturing waves with awful fidelity. Filips Koninck (1619-1688) was born in Amsterdam. He is most known as landscape painter. Rembrandt was his master and he also had this prepossession for perspective. Hendirk Avercamp (1585-1663) was a deaf­mute painter, he had great talents to depict the populous winterscapes of Dutch canals. Jacob van Ruisdael (1628-1682) became famous as a master of landscape art. He discoverered that two-thirds of all landscape is sky. He was the first great cloud painter. Jan van der Heyden (1637-1712) had excelled in linear and aerial perspective. The extreme detail in his paintings is kept in subordination to the general effect. Jan van Goyen (1596-1656) was the first to choose landscape painting for itself alone. He was born in Leiden and received his first teachings from Van Swanenburgh. Meindert Hobbema (1638-1709) was Ruisdael's pupil. He wasn't a popular painter during his lifetime and died poor. His scenes are brighter in tone than his master's. Pieter Molyn (1600-1661) was born in London and became a member of the Harlem Guild in 1616, he was soon called a "konstryk schilder," an artistic painter. The first view we have of landscape art pure and simple, the faithful transcription of natural objects, is given us by the Dutch landscape painters of the 17th century. 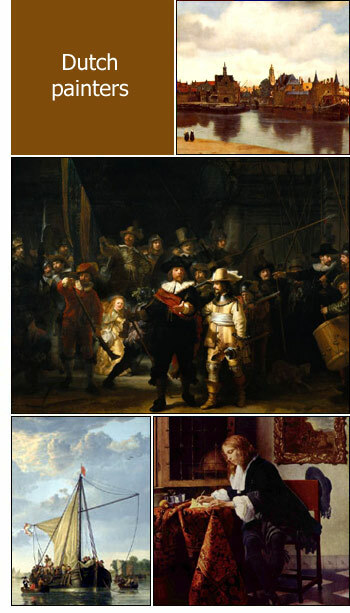 The Dutch artists were the first to give a distinctive character to landscape painting. They were marvellous interpreters of nature. They were the first realists, depicting nature for its own beauty, its own spirit. Through van Goyen and Wynants to Aelbert Cuyp, then on to Jacob van Ruisdael and Hobbema, these are the men who revealed nature strongly, sanely, largely. The impalpable, limitless sky, the enveloping atmosphere, the breaking tints of sun-chased clouds, the turbulent waters or calm, transparent streams, the green, the brown, the gold of foliage or harvest, all this they portrayed. The first steps to turn from the Italian interpretation of landscape, as taught by Elsheimer or by his heavy counterpart, Salvator Rosa, were hesitating and often failing. But Jan Gerritsz Cuyp (1575-1651), the father of Aelbert Cuyp, whose only works in the Netherland Galleries are portraits, essayed to show also the rich, characterful life of nature with its wealth of beauty. His first instruction was received from Abraham Bloemaert, but his independent development was not constrained, and he left the imaginary world of his master's composing for one of the reality of life. Esaias van de Velde (1590-1630), of Haarlem, also chose these subjects, still replete with human activity, but at the same time with an outdoor feeling that was setting the mark for larger expression. His few pictures that remain give us scenes of wars and fairs and portraits, but always with intimate, local landscape settings, and no longer with an exotic, garish Italian sky.